Fans of arcade racers just haven’t been in a good place and for some time. Arcade racers just aren’t the money makers that they once were and we’ve seen the decline of the genre for a while now. However, Codemasters plans to revitalize the arcade racing genre with their upcoming title, ONRUSH. The folks working on the title are also some of the same people who used to belong to Evolution Studios. The very same team that worked on MotorStorm and Driveclub. Which is clear as some of their DNA has made its way into ONRUSH. Based on my six hours with the Xbox One open beta, I feel they definitely have scratched my itch and then some. Arcade racing games are about one thing; getting from the start to the finish, as fast as possible. The sensation of speed is important and I feel that ONRUSH has nailed this and then some. As soon as you start a race, it’s a non-stop race that combines not only speed but also teamwork. Yes, I said teamwork. You’re not on the track alone, instead, you’ll be along friends as the game is an online affair (or at least it is in the demo). In fact, it seems like this is a MOBA on wheels. 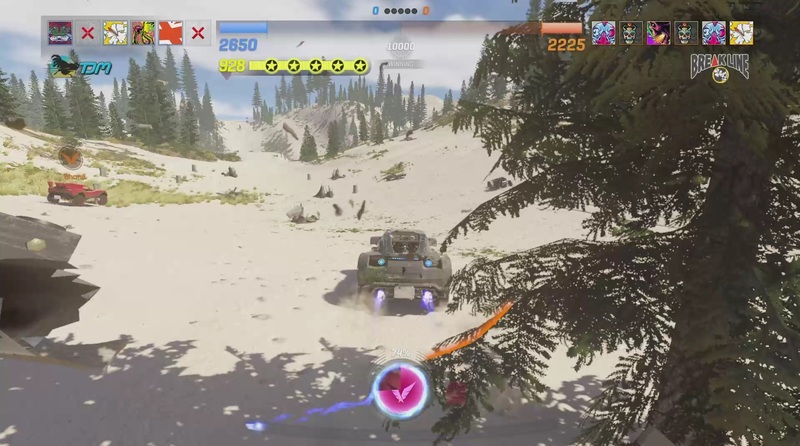 You see, there’s no finish line in ONRUSH. Just forget about the traditional racing that you’re used to. Here, you race for points via several different game modes; Overdrive, which is the closest to the traditional racing formula. Here you use your boost as fuel and attempt to gain an edge over your rivals. While Countdown, has you racing against the clock, as you attempt to navigate through gates that are scattered throughout the track. Run out of time and your team loses. There are two other modes, Switch and Lockdown. However, neither of those two were available in the beta. At the start of the race, you have your choice of four vehicles. All of which have their own characteristics, which in turn will benefit you and your team. Some provide shields, other provide distractions on the race course and more. While in the beta it was every man or woman for themselves, when the actual game comes out I can see the vehicle selection having a bit more importance. For now, I picked what I thought looked cool. As I mentioned, you don’t just race, you collect points. Smashing into other vehicles at every chance you get. 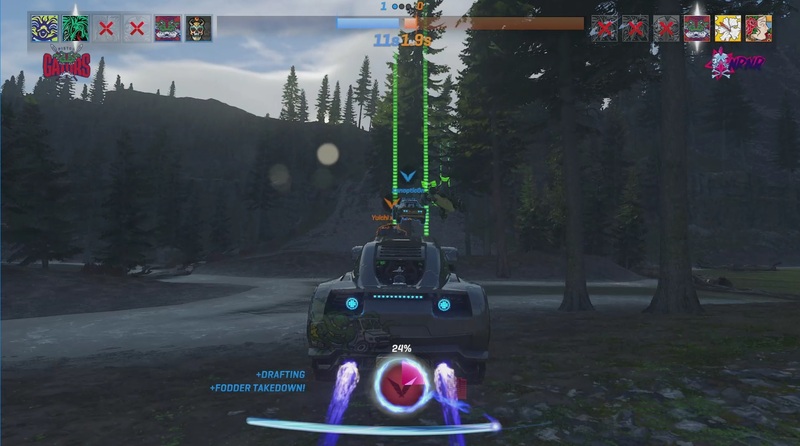 Taking them out by ramming them into other vehicles, the environment (damn you, trees!) or other obstacles ensure that you score a booty and stop the other team from scoring. See, when a person gets knocked out, they can’t earn points until they respawn. Knock out one person and you hurt the other team. Take out more than one and now it becomes a problem. There’s a strategy here that you don’t find in any arcade racing games out there. But it’s more than just taking out the enemy. It’s about staying alive as long as you can, or hitting that jump and getting some major air. Pulling off that trick if you’re on the motorcycle or saving your RUSH ability, which is a blast of speed, for the right second. There’s also cannon fodder on the tracks, in the form of AI controller vehicles that serve no other purpose than to raise your score. I also enjoyed the over the top presentation. The music is just the high voltage prescription that the doctor ordered and I liked the soundbites whenever you wreck someone or they wreck you. It fits the game, but I’m sure some may think otherwise. Honestly, there’s not a lot of bad going on here. That is unless you were someone who was expecting this to be MotorStorm 2.0. Because it isn’t. That said, I wasn’t a fan of knockout or damage system. As it stands, if you take one hit you’re placed into what I call the danger zone. During this anything that hits you will wreck you. Anything! You could stop and gently tap a tree or a barrier and you get knocked out. I also noticed I got taken out at times when nothing appeared to hit me. Several times I got smacked and after watching the replay, I didn’t see who was responsible. It’s a bit frustrating. Speaking of the replay system, it needs to have a toggle for switching on or off. Currently, it takes a few seconds for it to play through and another four seconds for you to spawn back on the track. That’s six seconds that you’re out of commission in a game that’s about going fast. During the beta, I did experience multiple disconnects and instances where it would hang on the waiting for players screen. I’m going to assume that this is a peer to peer game, based on this. Now, while I don’t have any issues with that, it does mean that we’ll be at the mercy of the host. That usually tends to cause issues. We’ll just have to see how this plays out. Lastly, the race results segment is a bit too long. I wasn’t feeling the “best of the race”, as it took too long for me to get into another game. Either cram all of the that into one screen or kill off the animation to help it progress faster. Or let me just skip it completely. ONRUSH will be available on the PlayStation 4 and Xbox One on June 5th, 2018. It will support both the PlayStation 4 Pro and Xbox One X with enhanced visuals, as well as the option for prioritizing the frame rate or resolution. A PC version is also in the cards, with no announced release date.